I have taken my love of bicycles and animals, designed and crafted them into beautiful bicycle and animal ornaments. Each ornament is hand sculpted, molded, and then made into the ornaments you see. The animal ornaments are engraved on the back with the name of the animal! I am extremely proud to produce such beautifully crafted items, made in the USA. We have started small with our animal ornaments, since they are an expansion of our bike ornament line. Our ornaments appeal to bicycle enthusiasts, animal lovers, cat lovers, dog lovers, exotic animal lovers and exotic cat lovers. We pay tribute to cycling and animals in all forms, took our passion, freedom of spirit, art and designs public. From bicycle ornaments to exotic cats to cat and dog ornaments, we try to make each design as authentic and awe inspiring as possible! 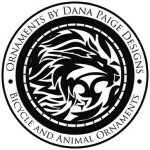 Our goal at ornamentsbydanapaige.com is to bring you handcrafted bicycle ornaments and animal ornaments – high quality, unique, and beautifully designed by artist, Dana Paige. My work can be found hanging/standing in galleries, homes, offices and organizations. My bicycle art has been commissioned by organizations, cycling groups, and some very prominent cyclists.